Urbis, the creative art space renowned for its inspiring exhibitions and off-the-wall galleries, is no more. Yesterday, it was decided that the exhibition centre would be replaced by the National Football Museum, which will move from its home at Preston's Deepdale stadium. Tom Mason, theEword's resident social media watcher, examined the reaction to the news on Twitter. Here, he reveals how the local community responded to the announcement. @UrbisManchester, better known as Vaughan Allen (chief executive at Urbis), has a strong following on Twitter. With just under 2,000 followers, the exhibition space is a popular account. 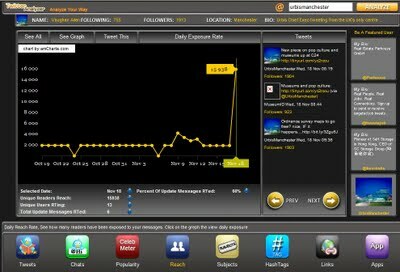 It also features in 81 unique lists (collection of different Twitter accounts created by users). 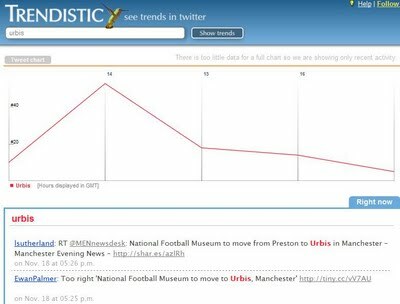 One hundred unique Twitter users posted an update featuring the word 'Urbis' between 1pm and 4pm on the afternoon of the announcement. Trendistic allows users to quickly monitor the volume of a keyword over a set amount of time, while also displaying any tweets containing the search term. This tool can be used to discover just how popular a phrase or subject is. The Trendistic graph below shows the quantity of tweets relating to Urbis over a four-hour period yesterday afternoon. The Manchester Evening News account broke the story of Urbis' demise earlier on Wednesday afternoon. The link to the story on the newspaper's homepage was displayed as a short URL in a Twitter message and clicked 152 times. It was retweeted by 34 seperate accounts. Bit.ly is one of the most popular URL-shortening programs. The software creates a singular short address for each link entered and allows users to monitor how many times a shortened URL has been clicked in its lifetime. Urbis was mentioned directly (with an '@' symbol) on 37 different occasions over the course of the afternoon. "Arts bods in Liverpool & Salford gobsmacked by @urbismanchester decision." If the number of RT and @ messages are combined, messages relating to Urbis and the National Football Museum were exposed to 15,938 unique different users. 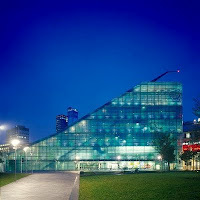 Whether or not the decision to turn Urbis into the new home of the National Football Museum was a good idea remains to be seen, although it is likely to bring an increased number of visitors to the area (more so than the neighbouring Victoria train station, which this week was dubbed the worst in the country). It is clear though that the vast majority of tweets relating to the move are less than complimentary. Perhaps something for @UrbisManchester to address in the run-up to the change.